Short course participants from the Mongolian Blind People’s Association with teacher Ven. Thubten Gyalmo and interpreter Khulan Dembereldorj, Ulaanbaatar, Mongolia, February 2018. Photo by Ianzhina Bartanova. 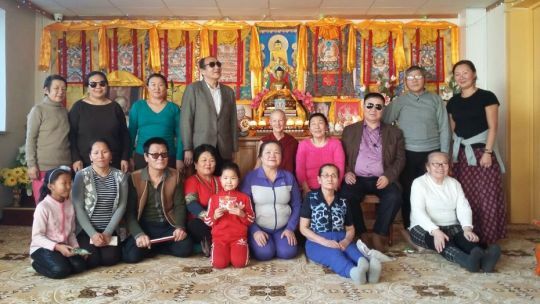 Ganden Do Ngag Shedrup Ling is delighted to share that in January and February we successfully offered a five-week meditation and relaxation course for fifteen people from the Mongolian Blind People’s Association. Approximately sixteen thousand Mongolians experience blindness. Of this number, two thousand are living in Mongolia’s capital city, Ulaanbaatar. Ninety percent of visually impaired Mongolians do not have an income, apart from a small monthly pension of 140,000 MNT (US$58) received from the government. Employment opportunities are extremely limited. Some visually impaired community members receive massage training so that they can provide massage services in various salons. In October 2017 we met with the Mongolian Blind People’s Association after they inquired about support for families with many children. At that time, we were able to distribute some clothing, blessing strings, and vitamins. We learned the Mongolian Blind People’s Association consists of approximately three thousand people, with seven hundred of these being quite active members. We began to discuss opportunities for future collaboration, and tried to identify ways that Ganden Do Ngag Shedrup Ling could benefit the organization’s community. The social worker at the Mongolian Blind People’s Association met with us and shared how difficult things can be for visually impaired community members in Ulaanbaatar. They can be reluctant to leave their apartments due to the fear of danger. Ulaanbaatar has many unpaved footpaths that are difficult to navigate, and it is dangerous to cross the street because drivers can be unpredictable and not mindful of pedestrians. Ven. 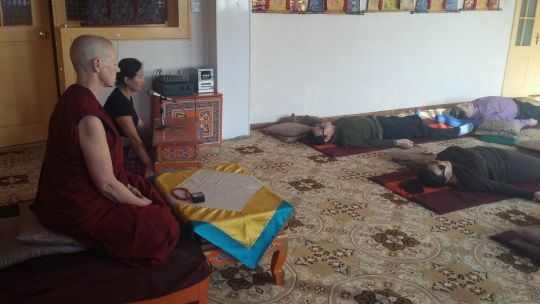 Thubten Gyalmo was very supportive of the idea of offering a breathing, relaxation, and meditation course to visually impared community members associated with the Mongolian Blind People’s Association. The goal for the course was to reduce stress and bring about more inner contentment. To make it easier for people to attend the course, we decided to hold the course at the head office of the Mongolian Blind People’s Association on the outskirts of Ulaanbaatar. Ven. Thubten Gyalmo and interpreter Khulan Dembereldorj, who also serves as Ganden Do Ngag Shedrup Ling’s spiritual program coordinator, traveled there to lead the course. We planned to meet at the head office for the entire course. However, our collaboration was so successful that by the third class, all fifteen course participants made their way to Ganden Do Ngag Shedrup Ling in the city center, having managed to find taxis for all. Some course participants were accompanied by their children and spouses. We could see how much the group was enjoying the outing and were delighted when some of the participants commented on the special environment of Ganden Do Ngag Shedrup Ling. At the conclusion of the third class everyone appeared relaxed and so pleased to have made the effort to come to Ganden Do Ngag Shedrup Ling. The wonderful outcome was that the group continued to make their way to Ganden Do Ngag Shedrup Ling for the remaining two classes of the five-week meditation and relaxation course. Short course participants from the Mongolian Blind People’s Association, Ulaanbaatar, Mongolia, February 2018. Photo by Ianzhina Bartanova. At the end of the course we offered a few copies of Lama Zopa Rinpoche’s book Ultimate Healing to the organization. The Mongolian Blind People’s Association coordinator, Degi promised that the book will be read aloud during their future meetings. We are now arranging for audio recordings of Ultimate Healing in Mongolian, so we can then offer these to the Mongolian Blind People’s Association. We agreed to continue our cooperation with the Mongolian Blind People’s Association at the earliest convenience.